Today’s adaptive enterprises have to leverage data to remain flexible and responsive, but they need the right data. But it isn’t easy: Many companies struggle to improve technical execution while maintaining the visibility executives need. 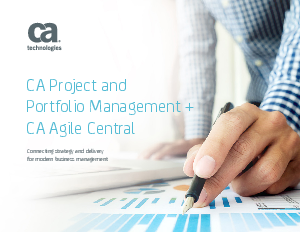 That’s why we created CA PPM + CA Agile Central, a seamless integration of our agile-management and business-portfolio management solutions. Together, they provide unparalleled visibility into both funding and work across every level of your organization.